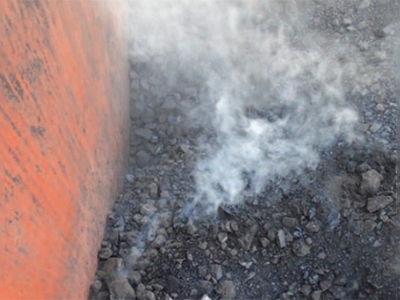 The West of England P&I Club issued a Loss Prevention Safety Alert to remind seafarers of the potential hazards that exist with coal, and also to provide practical advice on managing the risk. Coal is a potentially hazardous cargo and serious incidents continue to arise. In some instances it would appear that those on board were not entirely familiar with the risks, and on other occasions the coal was not carried in accordance with regulatory requirements or best practice. One example involved a crew member who was using a rotary wire brush on deck to remove patches of rust from the hatch coaming of a closed hold containing coal, possibly creating a source of ignition. While operating the equipment an explosion took place inside an adjacent hold, blowing the hatch covers upwards and propelling the crew member over the ship’s rail into the sea. He suffered serious injuries as a result. In another case a vessel with a cargo of Indonesian coal on board saw smoke rising from one of the holds while anchored outside the discharge port. The vessel had been asked to ventilate the holds just prior to berthing. However, in the absence of firm orders the vessel’s crew decided to ventilate the holds anyway in case they were instructed to berth at short notice. The vessel did not berth until several days later during which time the cargo in several holds began to self-heat. On another occasion a deck rating on board a vessel carrying coal was asked to take samples from inside a cargo hold and collapsed at the base of a vertical ladder leading from the main deck. Another deck rating entered the hold to assist him but collapsed in the same location, as did two more crew members in succession. Although all four crew members were eventually rescued, one lost his life and the others required hospital treatment for respiratory injuries. If coal is to be loaded, the shipper’s cargo declaration should be examined in detail to identify the properties of the cargo and the associated hazards. It should also be remembered that some cargo declarations may not be entirely accurate. All crew members should be informed about the possible risks before loading, perhaps during a shipboard safety meeting prior to arrival. The hazards and precautions may also be discussed when carrying out risk assessments or holding toolbox talks.